An NYPD lieutenant is the latest active-duty cop to say that the department still uses arrest and summons quotas, despite a 2010 state ban on the practice and a denial from the city's top cop. The lieutenant, who asked not to be identified for fear of retaliation, told the I-Team that the 10 active-duty cops in a federal class-action lawsuit against the NYPD who came forward this week "were telling the truth" about the illegal practice. “There is still a quota system within the NYPD,” the lieutenant said. 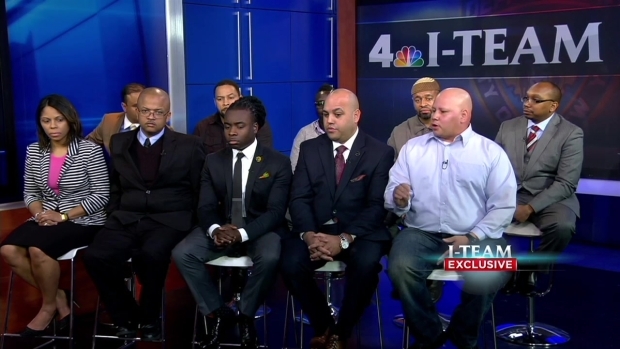 In an interview with the I-Team that aired Thursday, the 10 officers in the suit said that the NYPD still pursues quotas and punishes officers who don't hit numerical goals. The NYPD has repeatedly denied that quotas exist but that the department expects officers "to do their jobs." The lieutenant, who is not part of the class-action suit, said cops are under constant pressure to meet quota numbers and that officers who don't hit numbers are refered to as "zeros." "You know, every time I get called in the captain’s office, it’s 'one of your cops is a zero,'” the lieutenant said. The lieutenant also reiterated the 10 officers' claims that cops were told to primarily target minority areas, and that cops who don't keep pace with quota numbers are punished. "They are punished to the fact they will get very low evaluations," the lieutentant said. The I-Team first learned of the alleged quotas from the lead plaintiff in the suit, Edwin Raymond. Raymond said that he had been secretly recording his supervisors for two years in an effort to prove the alleged quotas. "This is something coming from the top that trickles its way down, and that’s why we’re here," Raymond told the I-Team on Thursday. Top NYPD officials have repeatedly denied the I-Team's requests for comments, but NYPD Commissioner Bill Bratton responded to Raymond's claims in February by calling them "bulls---." The department and Bratton have said that policies are focused on the quality of arrests and citations, not the quantity. In a statement Thursday, the NYPD added "There are no numerical quotas in the NYPD. However, we expect our members to do their jobs. Just like any other organization, there are performance standards through which employees are evaluated. Our officers and supervisors are evaluated according to how effectively and appropriately they address the conditions within their area of responsibility." The city has asked a federal judge to dismiss portions of the federal lawsuit, claiming the officers haven’t begun to prove a case for either quotas or racial discrimination. A decision could come at any time.